Use this power chakra guided meditation for activating your solar plexus chakra. This is also the third chakra in your body that governs your self-esteem, will power and ability for achievement. With its element as Fire, it signifies your 'city-of-jewel' or manipura (Sanskrit name for the chakra). Take a long and deep breath. As you exhale, move attention to the lower part of your chest, below the sternum, and imagine a bright yellow chakra. The sun-like yellow glow of the chakra spreads from your solar plexus to fill your chest first and then the rest of your body. 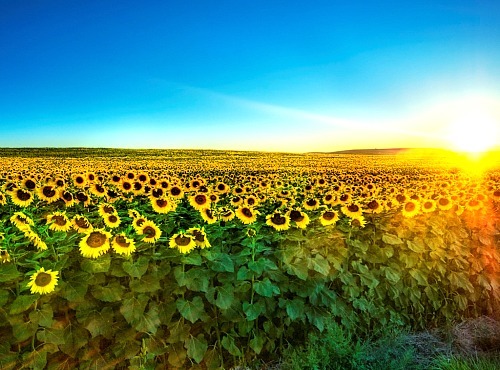 Imagine standing in an endless field of sunflowers or any yellow-colored flowers swaying gently in the breeze. The sky is a cloudless, azure blue and the sun bathes you and the field of flowers with its warm, nourishing rays. Now look up at the infinite expanse of sky and lock your eyes on the sun. The rays don't hurt your eyes. You find it soothing and pleasant to look at the sun. You find yourself rising and being pulled by the sun toward itself. The yellow fields are now far below and you are flying faster and faster. Even the earth has become a ball of blue in the distance. You get closer to the sun and register its true size for the first time. For all its heat and light, it looks warmly inviting and eager to embrace you. You head straight for its centre. You become one with the sun's core and can see all the planets revolving around you. Now see your third chakra spinning and gaining strength. As it spins faster, a yellow light washes over you and pervades every cell, every pore in your body. Breathe deeply and feel the energy funneling down your spine to the third chakra. Gently start to float and fly again - this time toward the earth. You ride on the sun's rays back to the field of yellow flowers. Look back at the sun and feel one with it. A free power chakra guided meditation mp3 for download is a work-in-progress and should be available on the site soon. Until then, I hope the guided meditation script above serves you well. Also, third chakra meditation will help you learn different meditation techniques that can open and balance your solar plexus or power chakra.